Fish rot from the head…..
I’ve been fortunate to have had the opportunity to either work for, or with, many of the industries leaders in all segments: supplier, wholesaler and even retail. When I first started out, many industry leaders were part of the “greatest generation” and veterans of World War II. Today, many on the supplier side, are young entrepreneurs, some very successful, some just starting to sell beer. Even at the wholesaler level the next generation(s) are taking their place in family owned companies. These leaders on the brewery and supplier side include, but are not limited to, Harry Jersig, Bill and Pete Coors, Russ Cleary, Peter Stroh, Jim Koch, Bill Hackett, Mike Mazzoni, Frank Spinosa, Carlos Alvarez, Jack Joyce, Diane Fall, Albert Cramer, Lutz Issleib, Stan Mace, Glenn McDonald, Mike Mitaro, and Kim Jordan. Obviously, I could also go on with hundreds of names’ of leaders of distributorships I have known. As a young man in the beer business, I watched how these people led their companies and I followed how well they did. Of course, some were more successful than others. I also studied their failures, too. As the years went by, I watched with less interest in their successes or failures, but was more in tune with how the companies I was responsible for responded under my leadership. With that in mind, this past year, I read multiple books about the great American Generals and Admirals of WWII. Some of the generals that I studied in detail were, Patton, Nimitz, Leahy, Hasley, and King. Others that I did not spend as much time researching were Bradley, Rommel and Eisenhower. I was interested in what made these leaders great. Was there a common thread each exhibited? One thing I saw that separated these leaders from others was their willingness to take risks. They put themselves out there, time after time, sometimes failing, but they always did what had to be done and did not take the easy way. When you look at the word “leadership,” each of these great generals had the ability to make others admire them. Additional qualities each of these great leaders possessed included: a commanding presence, the ability to communicate effectively in front of all parties, and of course, they all followed the timeless adage that adversity doesn’t build one’s character, adversity reveals one’s character. As of late, there has been much discussion on the beer industries leaders or, lack thereof. Why is that? There have been some thoughts that it is due, in part, to the large breweries being managed by foreign interests. Perhaps it is the self-interests of senior management, and if it is, is it entirely their fault? Do today’s leaders really have the experience or skill sets that are needed? For many people, twenty years of experience is really one year of experience repeated twenty times! Do these leaders really know the business from the ground floor up? I was born at night…it just wasn’t last night! Prior to the 1980’s, Heineken, for all practical purposes, had the import market to itself. They were by far the number #1 import, and had been for years, even though their distribution system was primarily through wine and spirit houses. The growth of Corona, which took off with the change to the clear bottle, and then the move to six-packs and twelve-packs; was nothing short of amazing. It seemed like Corona passed Heineken standing still. Heineken knew something had to change. Around 1990, Heineken approached Glazer’s in Texas. Glazer’s had statewide distribution rights, and got an agreement to duel the brand with the Miller network. Glazer’s was set up for the off premise with limited, if any, on premise (draft) support. The Miller network was to service the on premise. This situation, along with Heileman Brewing Co. assigning brands to competing wholesalers, caused the wholesalers to have the state franchise laws modified. This was done in an effort to eliminate any dueling of brands, while keeping the line extensions with the current distributor. In 1999, Heineken then ended the dueling (grandfathered in) with Glazer’s. The MC network got the distribution rights for both the on and off premise. I’ve had a number of comments from wholesalers etc. regarding my previous posts on ABI, and as you would expect, they support the party lines. Those who are ABI wholesalers are in support of their actions, likewise, others are not. No surprise there. ABI is now assigning line extensions to wholesalers for brands such as Stella and Beck’s. In some states, extensions have been given to wholesalers who do not have the core brand, violating state laws by assigning brands elsewhere. So the question might be: Are these violations because of ABI wholesalers (Bud) who do not have Stella, and trying to align the brands with them? Or is it the competing wholesalers, who do have Stella, but will not sell it? Or are they just ignoring the state laws? I would think that any wholesaler, especially the ABI wholesaler, is concerned with the overall direction of ABI and its actions. With ABI continuing to acquire distributorships in certain markets, fighting to keep ownership in some (Chicago), Anchor programs, the Modelo litigation, and, how ABI is now assigning brands, the distributor should be concerned. The ABI/Modelo transaction will now probably happen at a huge initial cost to ABI; the pending sale of the Mexico brewery to STZ and the elimination of the 10-year option; however, the “size of the prize” is the brand, not the brewery. Once this is done, and some time passes, Bill Hackett will retire. Subsequently, an announcement will be made regarding his replacement, an ABI key executive from S. America named in an effort to “align our mutual goals.” Some years later, the CEO of Constellation will announce a “strategic shift,” the focus of which will be on the global wine and spirits segment and a divestment from Crown….to…who else, remember, no one thought AB could be bought. Well, I was born at night but it just wasn’t last night. A small act of kindness….. Almost every small south Texas town annually hosts a local event which helps foster community in that town. Most events are either rodeos or festivals which emphasize what the town is known for, like the Watermelon Festival in Luling, Texas or the Poteet Strawberry Festival in Poteet, Texas. The three largest rodeos in Texas are the Ft. Worth Stock Show and Rodeo, the San Antonio Stock Show and Rodeo, and the largest in the world, The Houston Livestock Show and Rodeo. Because these events attracted thousands of people from across the state and nation, the local beer companies would compete to buy the grand champion livestock. Schlitz, the largest selling brand for years, always bought the Houston Livestock Show and Rodeo champion, and at the San Antonio Stock Show and Rodeo, either Lone Star or Pearl purchased the champion livestock since these breweries were headquartered there. The animals typically were raised by local high school kids who used the money earned from the sale to pay for college tuition. The animal was typically donated to an orphanage. The Rio Grande Valley Livestock show was the biggest event in my area, and annually, in conjunction with the Pearl Brewing Co., we purchased the Grand Champion pig and would donate it to the boys’ home in the Valley. Every year I’d get a letter from the young owner of the Grand Champion pig thanking me and Pearl for helping finance his/her college education. I never sponsored any of these events with the thought of “selling” more beer, I did it because it was the right thing to do for the community that we embodied. I believe that almost all distributors feel this way when sponsoring an event of this nature. It is the right thing to do when we can help people in the community we serve. The three-tier system provides many services for our industry. As we know, the three-tier system is under attack from many critics either directly involved in the industry, politicians or the media. In defending the three-tier system, the industry has emphasized such benefits as: quality control for fresher beer; efforts to eliminate under age drinking and DUI enforcement, and, of course; effective service to the retail trade. While all of these planks support the three-tier system, perhaps the community support distributors provide is the most important platform for the three-tier argument. I once knew a Miller distributor who had, for the second time become the dominate distributor. He first success was with Falstaff. This gentleman refused to support anything in the community. In his opinion, supporting community events was not important. He assumed Miller would die, as had Falstaff and why waste the time and money. He has been long gone from the business. It’s funny how those who support the market are ones usually doing very well. Whether it’s a rodeo or a festival, or even a German Oktoberfest (best kind of special event), the local distributor involvement makes it special. I look back with great fondness on those letters from the young future farmers who thanked me for buying their livestock. Those letters are really a small act of kindness! 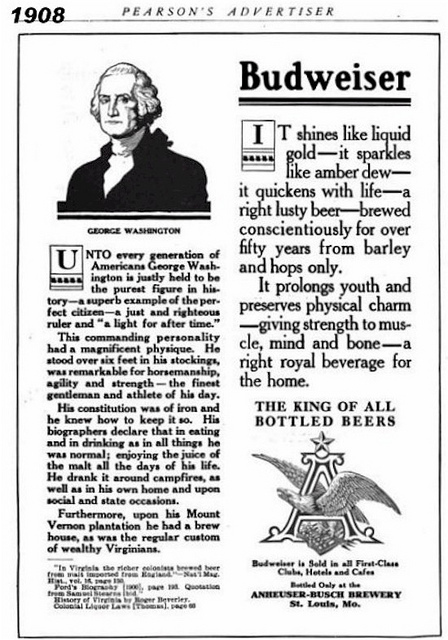 Ambitious Brew – The Story of American Beer, by Maureen Ogle, is an outstanding and well written history of the American beer business. Interestingly, it was published in 2006. 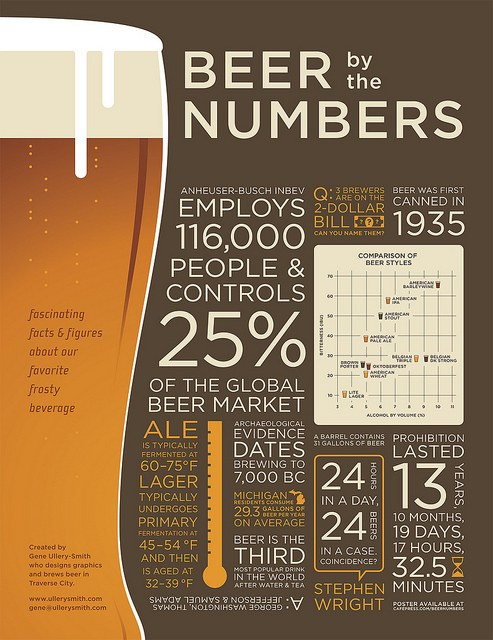 Since its’ publication seven years ago, much has changed in the beer industry. The sale of AB to InBev and the growth of the crafts have been two of the most remarkable events to have occurred. In my early years in the business, I watched how the strong regionals gave way to the “major” brands, Budweiser, Schlitz, Miller and Coors. Then, the rise of the line extension, “lights,” as the domestic premiums started to fade. The early nineties brought the beginnings of crafts as Anchor Steam, Pete’s, Sierra Nevada and Boston all started to increase in sales with the Northwest breweries coming soon after. In those early years of craft beer, what stands out to me is the fact that they all are from the west coast and Colorado. These states were incubators for the craft industry and their states had laws which, not only allowed them to grow, but encourage the craft industry. As we all know, crafts are up to a 30+ share in these west coast states. The largest event in craft, the GABF, is still in Denver, and always a sell-out. Just recently, the Dallas Morning News ran a featured article on Dallas/Ft. Worth area microbreweries entitled, Where the Beer Flows, which reviewed over eight local area breweries. This is somewhat remarkable as Texas doesn’t have a history of developing craft beers. In the nineties, several breweries tried to get started. Texas Brewing Co., Great Grains Brewing, Main St. and the Reinheitsgobat Brewery all brewed, but eventually went out of business for various reasons, mostly because the Texas state laws were not helpful to the craft industry. Only St. Arnold’s in Houston got established, but not without tremendous effort. Recently, in spite of the prohibiting laws in Texas, many new breweries are either now operating or are in the planning stages. There is a concentrated effort by the craft brewers in Texas to modify and change the laws to allow them to compete with out-of-state-crafts on a more level playing field. Just having the ability to sell beer to visitors to their respective breweries would make a huge difference to these craft brewers. Despite the fact that changes are occurring at the Texas capital, any changes in franchise protection will be difficult at best. Many of these new breweries are currently self-distributing. But as we all know, they will eventually have to go to the distributor tier to grow horizontially. Without the middle tier, these brewers are destined be limited in what they can accomplish. A modified franchise statue should have a provision, not unlike New York or Illinois, that provides a buy-out clause if under a distributors certain percent of business. The growth of the crafts in Texas in recent years is truly amazing given the legal environment in which they must operate. Imaging what the industry could experience with laws similar to Colorado or Oregon? Until these changes occur we continue to have met the enemy… and he is us!